For years now I have been looking to get the best out of my fishing catching the odd big fish obviously helps but I grew tired of skull dragging a 3oz pout in with 6oz of weight with a 13ft beachcaster, that’s just no fun! So to have more sport I wanted to scale down some of my beachcaster gear to match the species I’m fishing for. For bass, bream,and especially flounder I would prefer not to use a heavyweight 13ft rod rated at 6oz that can cast a zillion yards. Continental rods I hear you all scream! I agree with the whole continental rod debate, but I just don’t like using fixed spool reels for beach work. 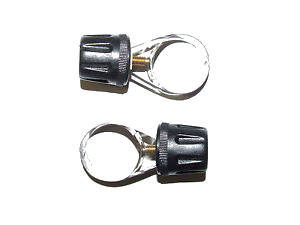 I’m left handed and when it comes to multipliers I don’t suffer that badly using right handed reels. 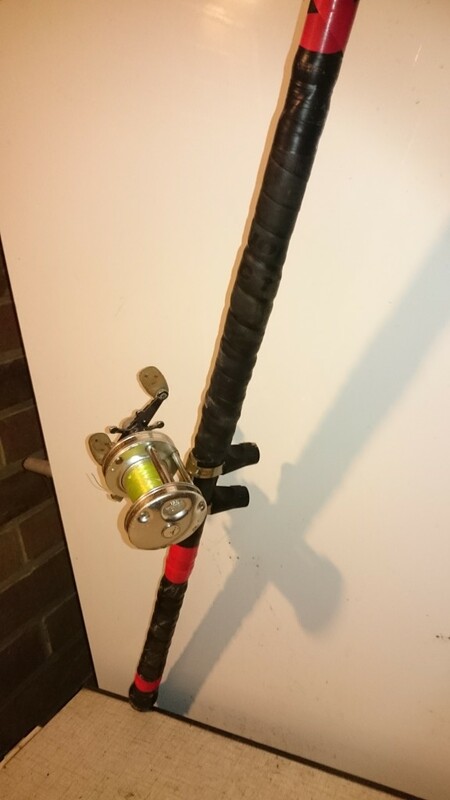 That is providing I can have the reel in the low down position and the rod button wedged in my hip. This is where the rampage and I have problems as the reel seat is a screw winch fitting in the “up” position. I cut off the winch fitting and secured the reel in its new position with coasters. Coasters to secure reel to rod. 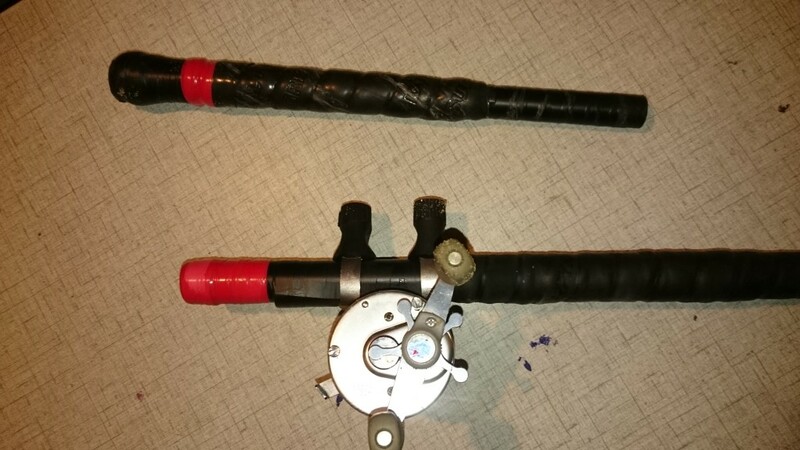 Grips were added using tennis racquet tape and I fashioned a reducer to fit into the end of the rod. 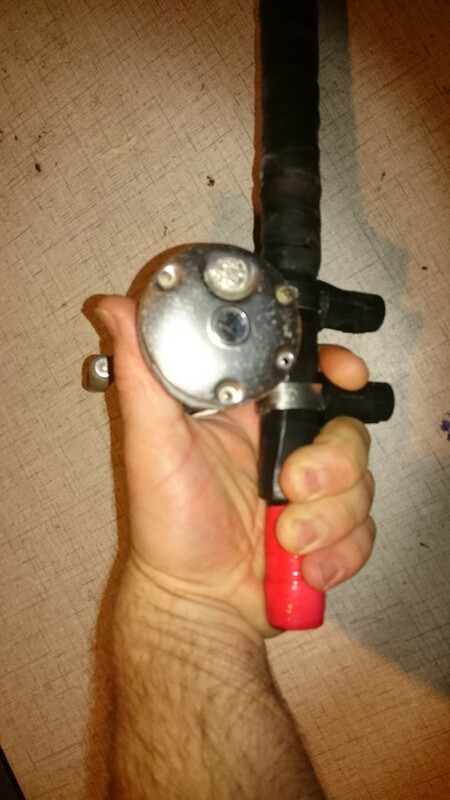 The next step to was to test it out so it was off to Lake pier beach Saturday evening as it was just a test, I only got a quids worth of ragworm from Castaways Hamworthy. Using 3oz and 4oz weights I was casting pop up rigs various distances, these rigs are not very aerodynamic so distance casting was never going to be achievable. I didn’t even check the tides, but by pure chance I found I had arrived at high water, my favourite state of tide to fish. I had heard reports that there had been one or two flounder about so I was confident I might even christen the new rebooted rod. After an hour of casting various distances and styles I was very pleased with the rods performance. The evening was glorious the wind had dropped away to nothing and it was close to the frosty conditions I like for flounder fishing, with conditions being near on perfect I regretted not getting more bait! After an hour or so on went the last of the ragworm and I started to packed up. Out of the corner of my eye I noticed a slight nod on the rod tip, the tips on these rods are very sensitive so I ignored it and carried on packing up. At last it was just a case of packing up my newly personalised rod, on lifting it I could immediately feel a difference in the usual weight of the gear on the end. Again a nod to how sensitive these rods are! Reeling in to the waters edge a small flounder flick flacked its way in to the beach. Not a monster but most welcome. So that was it, the rod had passed with flying colours but more importantly I had caught a flounder, which for me is an indicator that some of the best fishing that Poole Harbour has to offer has started. 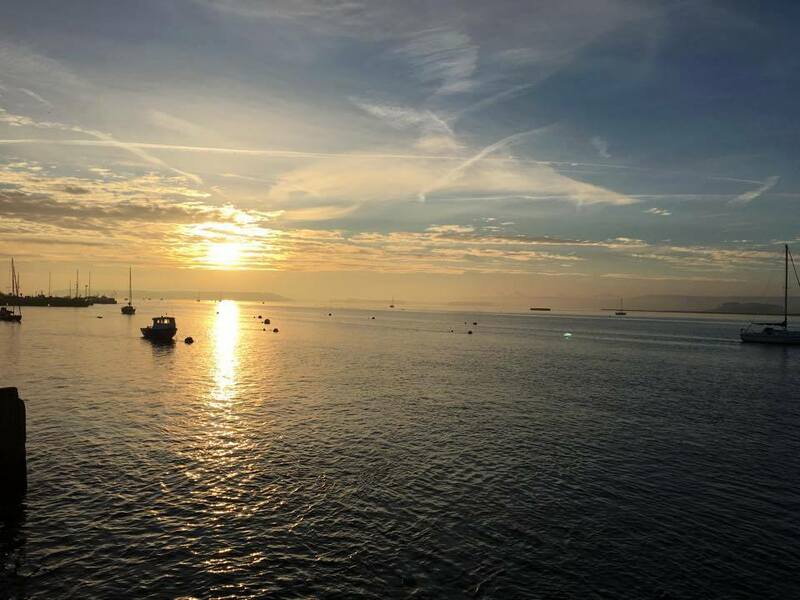 Once again the quest begins, Poole Harbour has the potential to produce fish capable of easily breaking the British flounder record, and I hope I’m around when it happens. For flounder all the usual marks Baiter, Hamworthy Park, Evening hill will produce flounder on pop up rigs,flapper rigs in fact any rig with with a size 1 or 1/0 hook baited with ragworm. 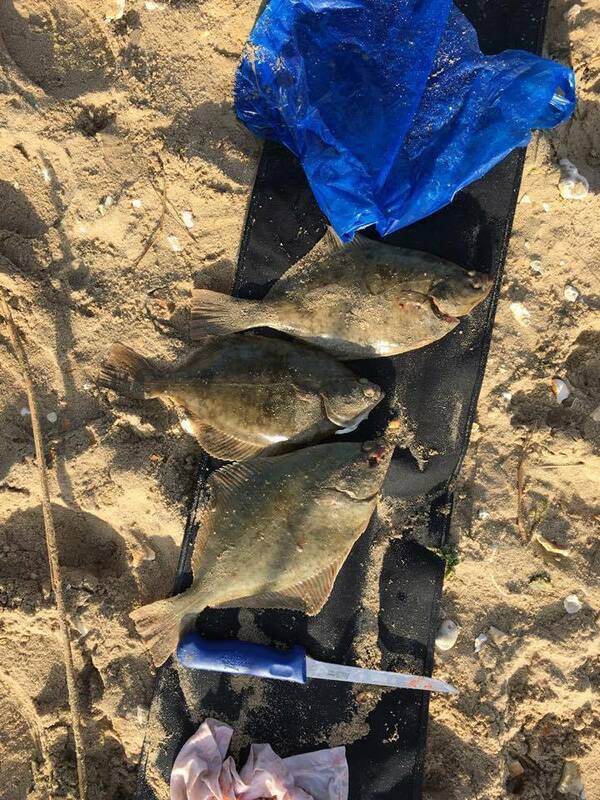 Just received an catch report from Ash Clarke who had a great day yesterday, as well as the corking weather and views he landed 3 good sized flounder. Testament that under the right conditions the flounder season is well under way. The boats in the harbour are still catching good codling with an unconfirmed cod of 28lb caught in nets in the harbour entrance. Southbourne still continues to produce good whiting and codling on the bigger tides. You shouldn’t rule out catching a good ray there either on squid or fish baits. The purbecks are the place to be if you want big conger on big squid cuttle or fish baits but are compromised by the rough weather. Be careful if you can get to the waters edge. That big swell can be lethal! 4 Responses to "A very small but welcome flounder"
Interested in fishing Poole Harbour for flounder but when I visited for an exploratory look was concerned with the amount of wind surfers. A chap I was watching fish Evening Hill packed up because they kept on cutting in close across his lines. Is this a normal problem? 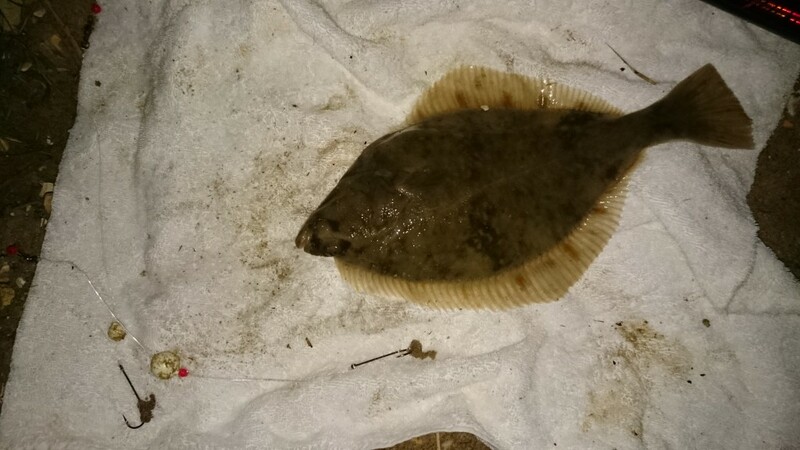 If it is, was thinking of overcoming the problem by fishing at night, but have been told flounders don’t feed very well at night, is this true? 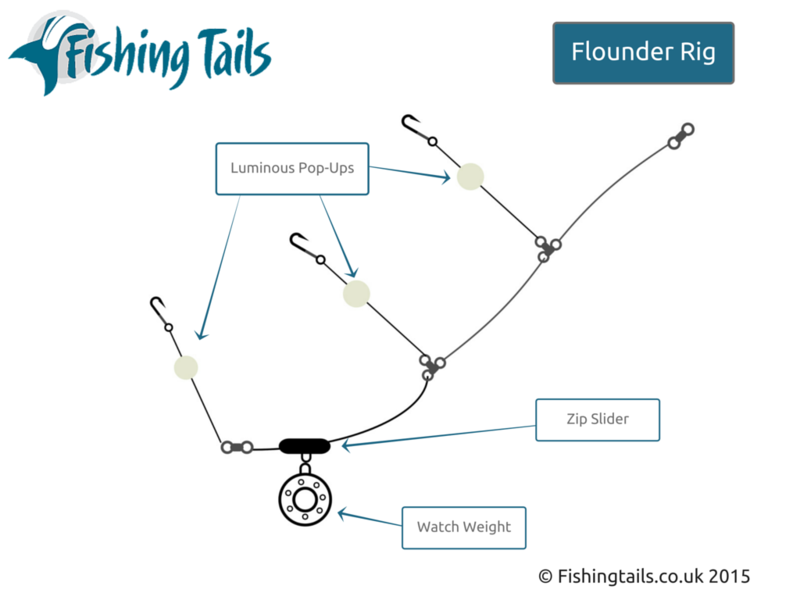 Like the look of your flounder rig but how long are the pop up snoods do you recommend? I’ve always tended to shy away from the windsurfing area at evening hill at least until it’s dark. There are plenty of areas further up the harbour away from that area. Most of the marks are in the first ever post I wrote. As for fishing night or day. There are many arguments for which is better. Personally I think it has more to do tidal state. I like to fish the flood tide up to slack water at the top of high tide. I have caught Flounder at around this stage of tide in both the daytime and night time. When I make my pop up rigs. I make the snoods around 4 or 5 inches long 100mm to 125mm long in new money?. I sympathise with trev creese. Buying off the Internet is a nightmare. There is very little backup in terms of after sales service. At least buying from a tackle shop you can argue your case. Bought the 13′ rampage surf about 18 months ago, I agree it casts really well. Unfortunately out of the blue whilst mackerel fishing this summer it snapped in half. Complained to online store – not interested, over a year old. Complained to Penn – also not interested, apparently I must have stood on it.